The license type you assign to a user determines the scope of available phone features such as basic calling to advance collaborative capabilities. Depending on your subscription, you can have VO Licenses, such as basic, limited, and unlimited license, or VCC Licenses, such as a VCC agent with Expert Connect or X series. 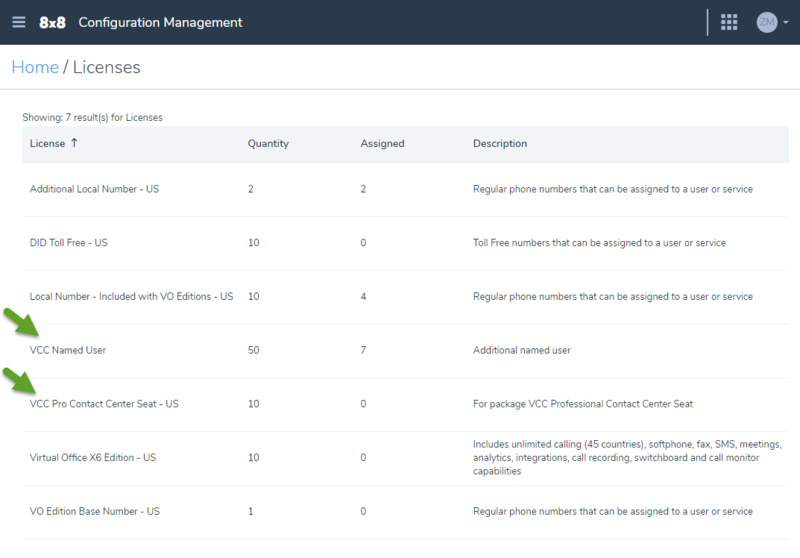 Log in to Configuration Manager and navigate to Home > Licenses to view the list of available licenses for your account, their description, and quantity. You can also see how many of the licenses are assigned to users. For the latest available licenses and services at 8x8, Inc., visit https://support.8x8.com. Virtual Office Lobby: Includes basic extension-to-extension calling and analytics capabilities. Virtual Office Basic: Includes metered calling, softphone and analytics capabilities. Virtual Office Editions: Includes unlimited calling, softphone, fax, SMS, meetings, analytics, integration capabilities, and more. For the latest available licenses and services at 8x8, Inc., visit https://support.8x8.com. VCC Agent: Virtual Contact Center Edition Users use this license to assign VCC agent privileges. For X Series users: Select an appropriate X series bundle which supports VCC services. A user without a license is just a contact. The contact cannot function as a user until a service or license is assigned to them. You can choose any license from the license drop-down, whether upgrade or downgrade. When you downgrade a license, the user's phone number, extension number, call forwarding rules, and other shared settings between licenses are preserved. The system automatically changes the features that are not shared between the licenses such as Switchboard Pro or Virtual Office Analytics. For example, when you downgrade a user license,Virtual Office Analytics automatically changes from Supervisor to Essentials. When you upgrade a license, however, you still need to configure the user profile to allow the new feature capabilities. In the above example, you need to modify the user profile to allow the supervisor capabilities instead of regular user for Virtual Office Analytics. What desk phones or softphones can I provision for my users? With Virtual Office Editions or Virtual Office Classic and Virtual Contact Center licenses, you can use Virtual Office desktop app softphone or any desk phone supported by 8x8, Inc., such as Polycom. With Virtual Contact Center license and dedicated extensions you must use a locked-down Virtual Contact Center desk phone. Users do not need a Virtual Office Editions or Virtual Office Classic license for dedicated extension. Only Virtual Contact Center services are assigned to these users. 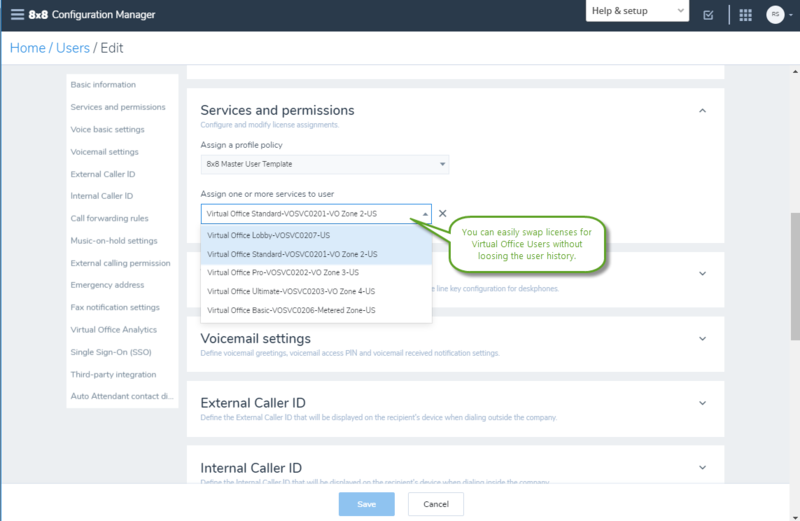 The Virtual Contact Center users can also use a compatible third-party softphone or desk phone (such as Bria or any landline or mobile number for users working from home). See the third-party phones and 8x8 services for more information. Can we use Virtual Office desktop app with Virtual Contact Center dedicated extension instead of a desk phone? No. In order to view all the transaction information associated with a call, you need a locked-down desk phone for Virtual Contact Center dedicated extension. All phone functions such as putting calls on hold or transferring the calls, must be performed on the dedicated locked-down phone.